Freshly shorn sheep coming back to the farm. We have sheep out here in the woods where we also have coyotes, wolves, and bears who could easily prey on our soft and foolish sheep. Sheep, to be completely honest, are incredibly stupid. They are just hopeless. Nothing makes more real the scriptures that refer to the followers of Christ as sheep as owning sheep and struggling with them. We are just as lost and just as likely to be reckless as our sheep. I am most definitely a sheep. 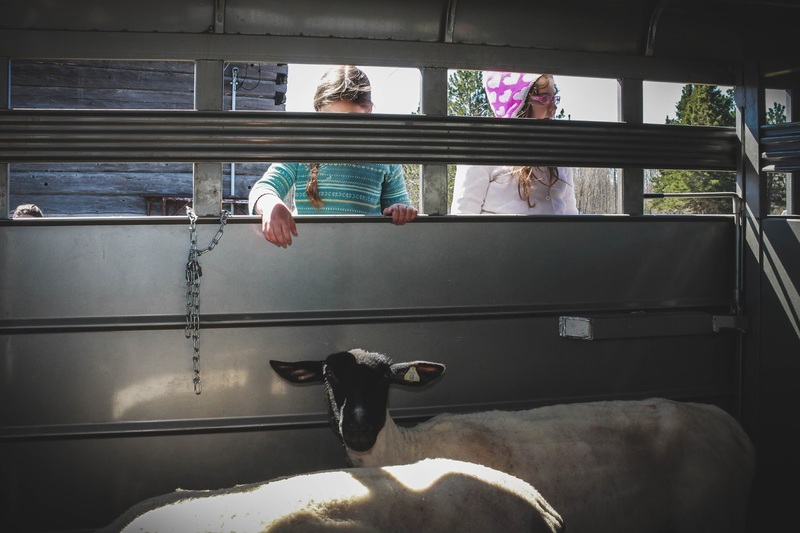 Veronica and Cristina peeking in at the sheep after shearing. Their vulnerability and devotion are as beautiful as their collective madness is frustrating. When we have an electric storm, something not nearly as common as it was Colorado, they panic and run away to hide under trees and they refuse to go into the barn like the other animals do. If we see a storm coming, we have to be proactive and actually put them in the barn and shut the door to prevent them leaving again. When frightened, they run, and often they run from safety. If we miss the beginning of the storm, we go out into the fields and trees and halter them and drag them to the barn because they will not come for love or grain. There is nothing so stressful as wrangling a terrified animal in wind and rain and lightning and unlike Jesus, I cannot calm the storm. All I can do is push through to lead them to safety and retreat back to the house if it is safe and wait out the storm in the barn if it isn’t. Recently, we had a sudden and unexpected storm blow in immediately after milking and the cows were safely in the barn, chewing their cud. 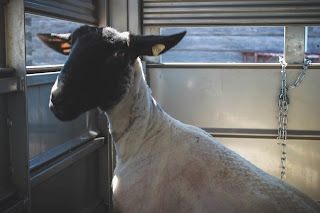 The sheep had panicked and broke through an electric fence and were running madly in the farm yard. I didn’t have time to grab my boots and so I ran out in my flip-flops and took my oldest daughter and two of the boys, sending one to the barn for the halters. We ran out in the lightning and pouring rain and immediately my glasses were covered and my feet were sliding around in my almost-shoes. I made the conscious decision that even if my feet were trampled or I was knocked down, that I had to keep diving for sheep until I had them. It had to be done. I did slip and fall face down into a utility wagon and I was sore and horrible bruised the next day but I just jumped back up and kept running. 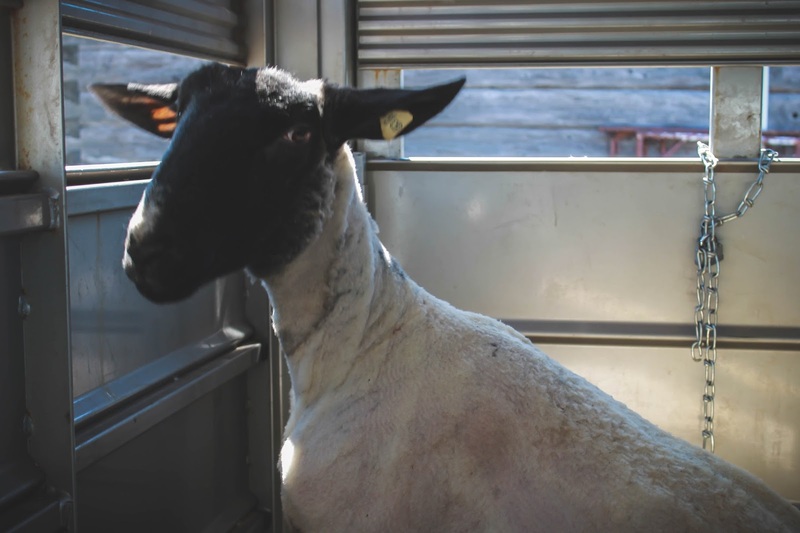 When I had a sheep in his halter, I kept a tight rein so that he would be right by my side, and I lead him to the barn as he repeatedly stepped on my bare feet with his sharp hooves. Once they were in, we were able to go back into the house. All of us were exhausted and soaked and bruised but no one complained. One of the boys started a little pot of espresso as we sat on the wooden benches, the water dripping off us. It is a matter of course when you have animals. 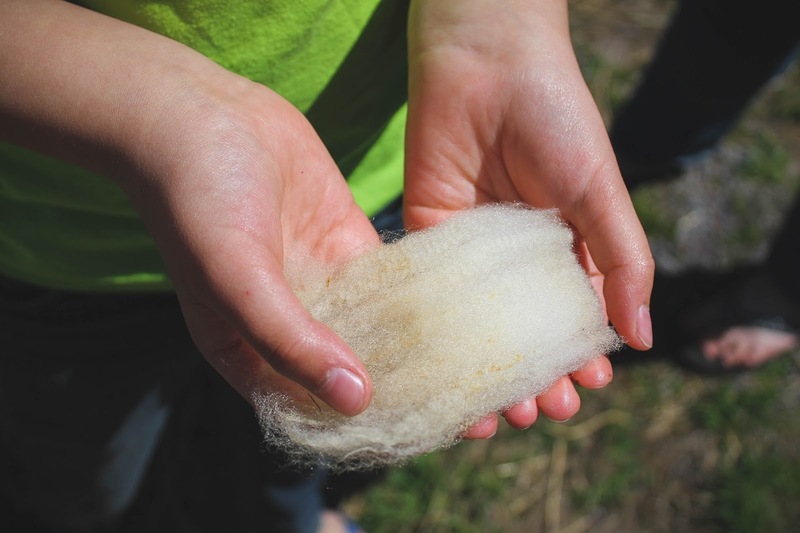 Jack holds a small piece of wool before processing. This spring, the sheep had gotten out and went into the poultry shed and managed to get into a bag of feed that had not been properly stored. One of the sheep is particularly stupid and he had put his head into the bag and gotten it stuck when he lifted his head and poured the grain out. He panicked and ran madly in the farm yard bumping into the vehicles and tractor and trees and he brayed miserably. I ran out with the children to save him. Once I had caught him, my daughter pulled the sack off his head. He breathed deeply and happily rubbed his sweaty head on her outstretched hand. Then he looked down, saw the grain sack, and we had to play the game all over again. Sheep run circles around Eli in early winter. We always care for them. We run out to gather them up when the coyotes start howling and they stand in the pasture calming eating the grass. We check on them throughout the day and do so with urgency when we can’t see them from the windows of the farmhouse. We don’t have a winter hydrant and so we hand carry water out to them all winter long, about a hundred gallons twice a day using a sled over the snow. We cut down noxious weeds to prevent them getting ill. When they are sick or injured or not getting along, we halter them in front of the house in the close apple orchard and keep vigil. On some level, they know how deeply they are cared for and often come when we call, or rather when their person calls. They know the shepherd's voice. In the winter, when fences are pretty much useless because of the depth of the snow and they freely ranged the farm, they would come up to the porch and in look in the kitchen window at the children, looking for their person. We are sheep and our foolishness and the frequency at which we return to the same sins, over and over again, can make us feel weak and foolish and even sheepish. We run from safety and often ignore the sounds of the coyotes calling in the outer fields. We are most definitely sheep who blindly cling to the other sheep in the field rather than run towards the barn. We are also the sort of sheep who know the Shepherd’s voice and when we chose to ignore it, it is at our own peril. I want to be the sort who hears His voice and runs towards Him knowing how He is running towards me. He doesn’t abandon us, He flies into the fields and ignores all His own suffering. Maybe that is why it is so easy to love those sheep and love them hard. It is because we are sheep ourselves. I really enjoyed your insight about this. I didn't know sheep were so stupid! Makes sense though. Baa! Love the way you have explained the whole story of sheep and made comparison of mankind with sheeps.That's so true that human creatures are one of the selfish one.